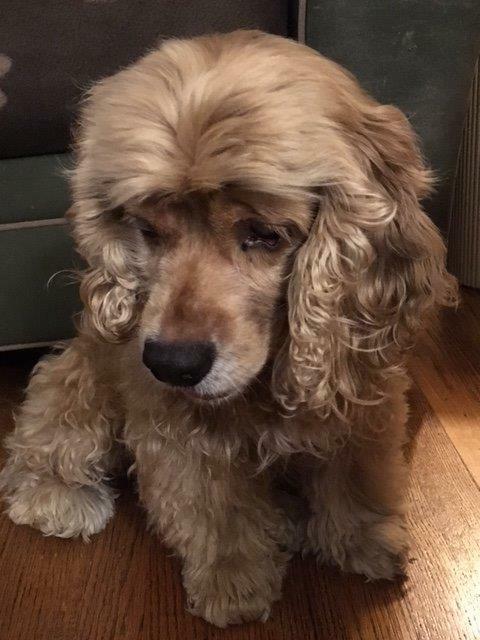 Lady [Adopted December 2016] is an 8-year-old blind female. She was going to be relinquished to a Chicago shelter because her owners could no longer care for her. The owners were heartbroken to give her up and they really wanted a rescue to take her so she would not have to go in to the shelter. Lady was rescued right away! We don’t know why she went blind or how long she has been blind but she certainly finds her way around quickly. Lady just had her eyes checked at the vet and it was determined that she does have a lot of pressure on both eyes. She will be having surgery in a couple weeks to remove the eyes so she does not have any pain. We learned that she previously lived with a cat. She is doing so well with our two male cockers. She is such a sweet girl and so affectionate we really think that she was loved very much by her previous owners. We do not crate her since she gets along well with our dogs. She does not have accidents at all. She goes right outside and does her business. She loves to sleep in the pet beds throughout the house and in our room at night. 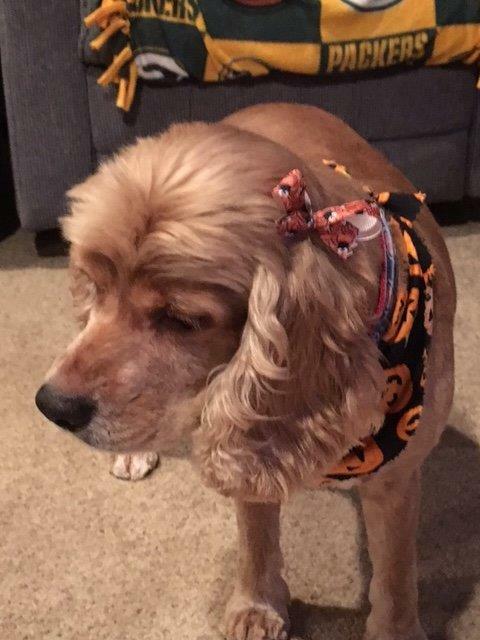 She was just recently groomed and had to be shaved down because she had matts. She was awesome with our groomer! She has warmed up to us so much in the last couple of weeks that she likes to jump up on the couch with us when we call her name. Lady needs a forever home where she can be spoiled with love in her golden years. We just love her to pieces! !